Euro area industrial production fell by 0.2% in February, leaving January’s 1.9% gain sandwiched between two smaller declines. Output is still rising on balance over three months at a 3.5% annual rate. That’s a reversal of its -2.1% annual rate over six months which is a worse result than its -0.1% year-on-year rate. This leaves IP expanding strongly and broadly over three months but still erratic with declines in December and February that are still broad-based across sectors and a weak year-on-year performance. Manufacturing output rose in February but with no clear patterns in play of either acceleration or deceleration. For manufacturing, the quarter-to-date, however, is very solid and strong across sectors except for capital goods output. Of the 11 EMU members whose manufacturing production we list in the table, eight show IP declines in February. Spain, Malta, Greece and Portugal show drops of more than one percent month-to-month. On the upside, Italy and France, the second and third largest EMU members by GDP, report output gains of more than 1% month-to-month. 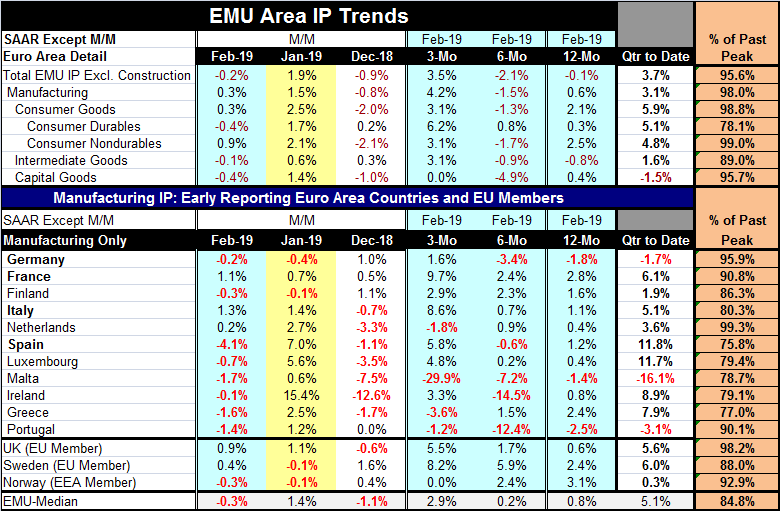 But Germany, the largest EMU economy, posts its second IP monthly decline in a row, but both of them are small declines. German output is still rising on balance over three months. The country level data are surprisingly uniform in mimicking the aggregate IP results. In January, when overall EMU IP rose, only two EMU countries showed output declines. But in December when EMU output fell, seven EMU nations logged IP drops and one had output unchanged on the month. Contrarily, in December the two largest EMU economies logged output increases as manufacturing IP fell. The four largest EMU nations German, France, Italy and Spain show sizeable output increases over three months, supporting the 4.2% annual rate gains seen in overall EMU manufacturing output. Four smaller to moderate-sized euro-economies suffer output declines over three months. Over six months, manufacturing output declines in five countries, a group that includes Germany. Year-over-year only three countries in the table Germany, Malta and Portugal show manufacturing output lower. Still, over 12 months, overall IP excluding construction declines in EMU despite a 0.6% rise in manufacturing output. The three Non-EMU countries, whose trends are in the bottom of the table, each show output increases over three months, six months and 12 months. Among EMU countries only France and Finland show manufacturing output accelerating across horizons sequentially from 12 months to six months to three months. In the Non-EMU group, Sweden also demonstrates acceleration. Among EMU nations only Malta and Greece, two small economies, show deceleration in place while for non-EMU countries Norwegian trends show deceleration. Trends in the EMU mostly show growth despite a series of very weak manufacturing PMI reports. Of the 12 sequential growth rates for the four largest countries (three-month, six-month and 12-month for each of four countries), only three of these are negative. Still, two of those are for Germany over six months and 12 months and one is for Spain over six months. While IP and sector data for manufacturing show there is a rebound in the making, the PMI data do not show that same pattern. PMI data for manufacturing in Europe (available through March) are still generally weak and deteriorating. And the raw PMI diffusion readings are among the weakest we have seen in the last 4.5 years. Still, the EMU sector story shows a rebounding trend pushed ahead by output in the consumer sector and for intermediate goods. The capital goods sector shows flat output over three months, declining output over six months and a very mild gain over 12 months. For the moment, European output is being driven by the consumer sector. Inflation has been kept under wraps except for some recent stirring driven by rising petroleum prices on the back of geopolitical instability in several oil producing states. Capacity use in manufacturing does not appear to be tight as output is 99.3% of its cycle peak in the Netherlands, 95.9% of its past peak in Germany, 90.8% in France, and 90.1% of its past peak in Portugal. But after those three countries, Italy is 80.3% of its past peak while Spain and four other members have percentages in their 70th percentile range. None of this looks much like capacity constraints are binding. In the current quarter-to-date, output is falling only in Germany, Malta and Portugal. Finland’s output is up at a 1.9% pace. Everywhere else output is rising at a pace of 3.6% (the Netherlands) or stronger. Output is stabilizing and stronger-looking in this report, especially when measured against the Markit PMI gauges. On balance, today’s headline on industrial output is negative, but manufacturing output is rising and EMU members show much more strength in this report than they show weakness. The main significant exception to that statement is Europe’s largest economy, Germany, but even there output is reviving and rising strongly over three months. If there are new concerns in Europe, it may be that Europe and the U.S. are starting to talk about trade and that dialogue could magnify concerns as the Trump administration has been bargaining hard on the trade front. Mario Draghi has made news by pledging that he is willing to do more if needed. But there are signs in this report that Europe may be ending its slowdown. China today reported a bounce in its exports with still weak imports. If China is reviving, that could spread. But the trade news involving the U.S. and China drags on and now we may see U.S. negotiation efforts broaden and that could be another fine kettle of fish to deal with. Europe still may not be out of the woods.